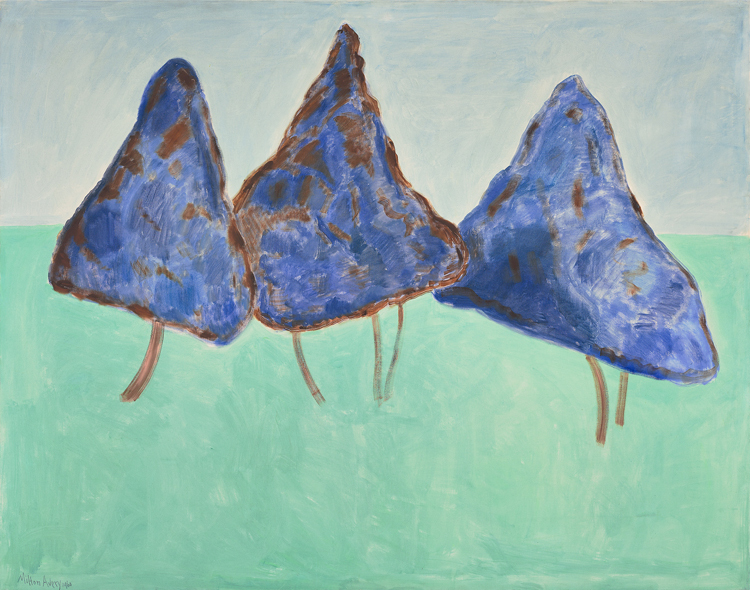 In his mid-seventies, Milton Avery brought decades of visual experience to bear on his perceptions of the world and an inclination toward simplification that may have intensified with his advancing age. At times, the artist’s late paintings veer so close to pure abstraction that only their titles enable the viewer to recognize the scene that has stirred Avery’s imagination. Such is the case here: three monumental cones swaying in the wind take flight as trees en pointe, their girth making for a comic ballet. A few weeks ago, prompted by a free-writing exercise based around this piece, we asked visitors to Seeing Nature and social media followers what they saw in this work without providing the title. Answers included floating pizza slices, icebergs, a gnome village, stingrays, and more. What do you see? This entry was posted in Exhibitions and tagged abstraction, dancing trees, interpretation, Milton Avery, Paul Allen, Seeing Nature. Bookmark the permalink. I saw this exhibit yesterday for the second time, having seen it in Portland during its time there . This painting stood out for me more strongly in your staging of the show. Walking into the gallery it is hanging in I knew immediately it was an Avery by the shapes of the trees: those rounded triangles are a motif in many of his paintings (including his other piece in Seeing Nature: note the woman’s profile). My first thought on seeing this painting was that these are leaves, interesting since they are in fact trees which contain leaves. Makes for a sort of visual synecdoche. I thought the Phllips’ staging of this exhibit was even better than Portland’s. The arrangement of the works and the design of your galleries make it the ideal venue. Thank you for sharing this feedback, Greg! I’ll pass your thoughts on to our curatorial team, I’m sure they’ll appreciate the kind words. So interesting that you were able to see the exhibition in two different venues, what a treat!